Okay...so we all know that the buzz around social media is in full swing causing heads left and right to stop and take a second glance at this thing we call engagement. Conversations are taking place and we all want to join in. Well...of course, because it's fun to interact and share information, build relationships, and enhance our connections. Social media is all about engagement and creating conversations that actually mean something and offer value to the participants. We have B2C and B2B activities that are all trying to garner the attention of the masses. However, let's slow down for a minute and remind ourselves that this thing we call social media is about people. People make this thing work. The social factor is the key that will dictate whether or not this new form of media can sustain its popularity and dynamic momentum. Let us not forget that it's still about the people and focusing on them. As we transition into a more measurable and returns based system that actually offers a return on investment, we will find that the key still remains on focusing on relationship building and the practice of offering relational value. Source: The Nielsen Company. Viewing estimates on this page include Live viewing and DVR playback on the Same Day, defined as 3am-3am. Ratings are the percentage of Hispanic TV homes in the U.S. tuned into television. The internet is a popular destination for many publishers, aspiring entrepreneurs, thought leaders, designers, creatives, and technology enthusiasts. The ability to connect and build empowering relationships leads to an enormous opportunity for mass collaboration. Today, we have a unique array of content generators who each have their own agenda in terms of marketing, branding, creativity, knowledge-sharing, trust building, image enhancing, promotion, networking, and the list is indeed quite enormous. As social media and the online environment continue to evolve, some key questions arise as to how individuals, organizations, and groups adapt and thrive. Several areas come to mind that when we really think about it shed some light on the potential for very positive possibilities. As Latinos continue to grow in influence, impact, and positive engagement the need for knowledge sharing and game-changing collaboration becomes evident. It's one thing to build up a large audience or create a movement and another to capitalize on the strength, synergy, and symbiosis of individuals with a common purpose. You are invited to share your thoughts about the future and necessary direction of Latinos in social media and beyond. We have journeyed beyond the path of traditional media into a new arena where the content and control are conveniently placed in the hands of the masses. Today it's easier than ever to publish ideas and sound off on virtually any subject imaginable. The essence of social media is built around the people factor. Consumers are no longer solely a target market or customer segment but rather a democracy of opinion, agents of influence, and dynamic content producers. 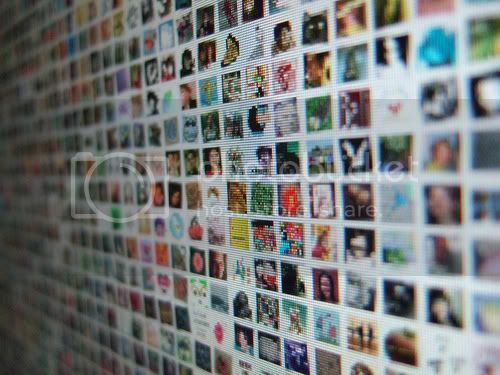 User generated content is what makes new media such a hot topic in today's society. The internet allows us to have a voice and be heard. The level of immediacy and intimacy offered to individuals is unparalleled in terms of media channels and modes of communication. Where and what we do with these tools is definitely up to the people. The U.S. Hispanic market is acculturating making it important for individuals interested in this important segment to accept the fact that being Latino in the United States is much larger and more involved than any one spoken language. The race is on to understand the true nature of bi-cultural consumers. 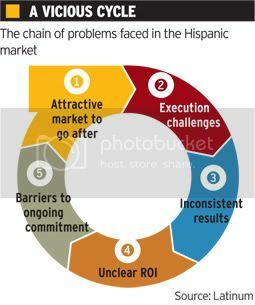 According to Latinum, a successful attempt to tap into the U.S. Hispanic Market is quite challenging often leading to a vicious cycle. I agree and feel that today's marketers have plenty of opportunity to evolve and truly connect with Latinos today.